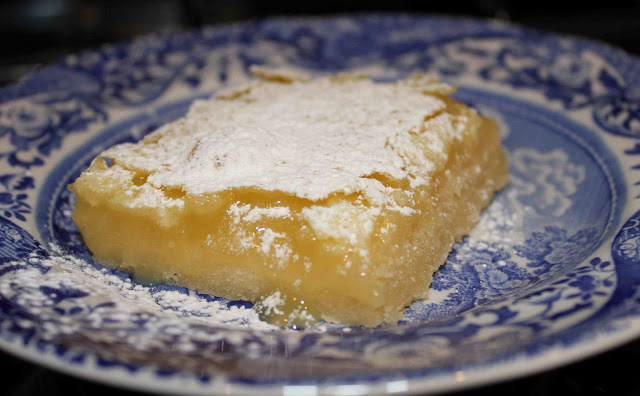 I love tart and fruity desserts, so here is one of my recipe’s for lemon bars. I’m not sure where this recipe came from, all I know is that they are super easy and very good. Enjoy! Beat 2 sticks of butter with powdered sugar and flour. Then press in pan and bake for 25 minutes. Meanwhile beat eggs and sugar. Combine flour and baking powder and add to egg mixture. Pour filling onto baked crust and return to oven for 25 minutes. Cool and sprinkle with powdered sugar and cut into squares. 2. Mix the three ingredients together in an electric mixer. Shape into a ball, and refrigerate for 30 minutes. 3. Butter a 9 x 13 inch pan. 4. Press dough in pan, and bake at 350 degrees for 25 minutes. 1. Beat eggs, sugar, salt, and lemon juice in an electric mixer. 2. Combine flour and powder and add to egg mixture. 3. Pour filling over baked crust, return to oven and bake for 25 minutes or until craters form. 4. Cool, sprinkle with powdered sugar, and cut into bars.